Aggressive and reckless riders are among the top irritants say motorcyclists, according to a national survey commissioned by Erie Insurance and conducted by Harris Poll. 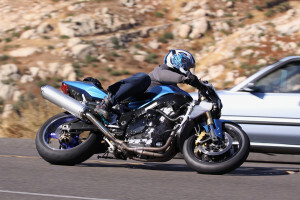 The online survey, conducted in June, asked nearly 200 U.S. motorcycle riders to share their top five pet peeves about both other riders and drivers of four-wheel vehicles, as well as the most common rookie rider mistakes. It also asked riders to fess up to the craziest, weirdest or most reckless thing they’d ever done while riding, or seen others do. Needless to say, that question yielded some quirky results.